Pan Mee no longer is a stranger to most of us and even some of you guys loving it with the original taste especially with the hand kneaded it out from the flour as that would be the authentic style, that I like Ah Tee or Jojo Pan Mee. 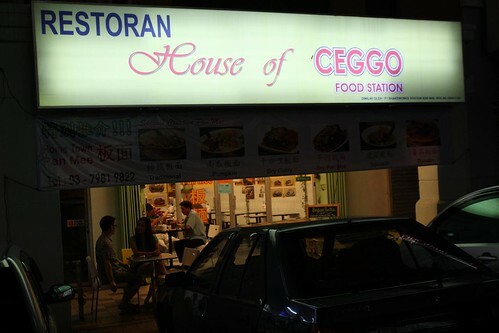 As now, more people are eating healthily, and I got so surprise that when I heard about this shop, House of Ceggo Food Station that located inside Taman Desa it’s a must go for me to try it out, with their unique preparation of soup base and cooking style of Pan Mee. This shop is not hard to be located which is directly inside the whole stretch of shoplot. 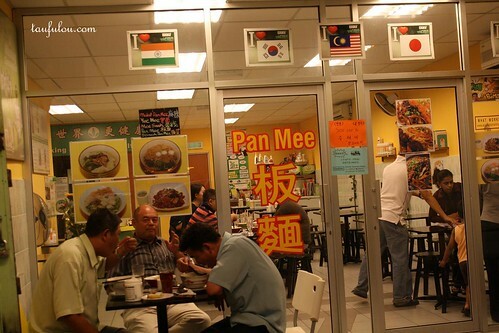 To me, the first feeling is more like those Hong Kong style cafe as what we seen in TVB with those push door and glass panel with two big chinese wordings on the glass panel. 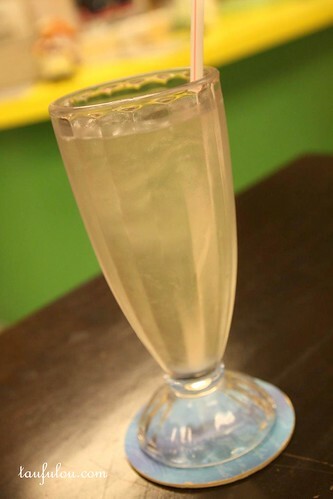 ‘Lemon Grass Drink’ as I never really like the taste of the lemon grass but suprisingly the taste is not that strong as it taste quite fragrant and I end up having two glass of it. 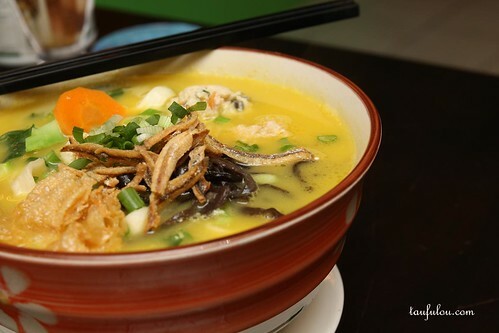 As I mention with those Hand Peeled or Hand Kneaded is one of the authentic way to prepare this Pan Mee but as the picture shown in the menu for the types of Noodle available, its quite cute for its description. 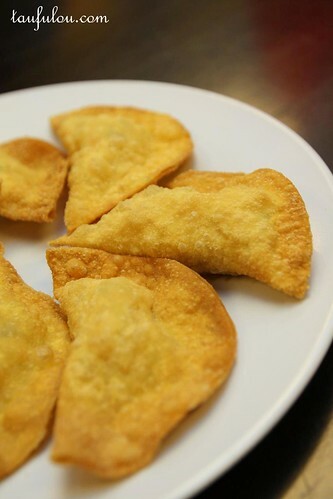 ‘Fried Sui Kau’ Deep fried with solid mince meat, mix with small chunks of water chestnut, and some finely chopped spinach is good, crispy on the skin and dip with chili sauce is always the best. 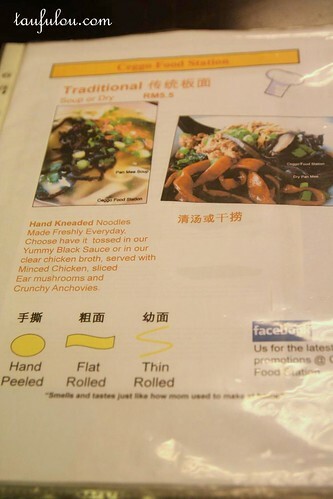 Flat Rolled noodle as shown in the pictures. 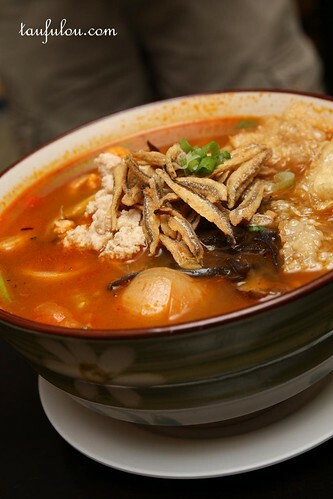 ‘Ma Lat (Extra Spicy) Pan Mee’ that we got deceived by the fiery red colour of it and thought that it would be extremely spicy, but it turns out to be a bit of sour and spicy level which is not that Spicy to me and the rest. 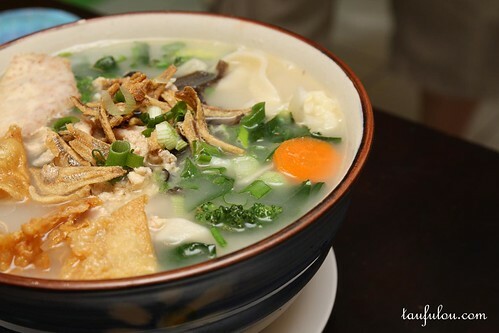 If you are yam lover then you would want to miss their ‘Yam Pan Mee’ that used huge piece of yam cook inside the soup then cut into pieces to serve along with noodle and you just imagine, the yam fragrance and the soup did taste a bit ashy from the long boiled yam in the stove. 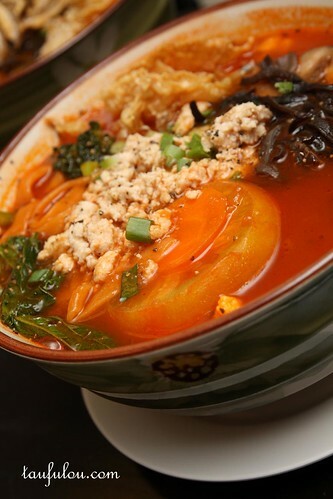 Good Soup base I would say. 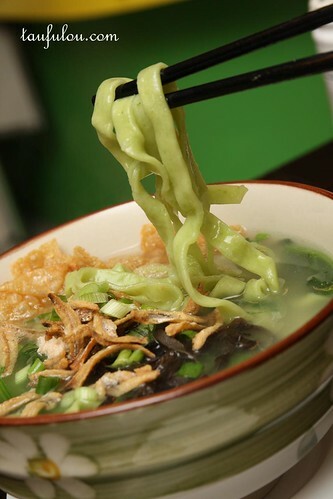 Opt for something healthy or you dont feel well on that day, ‘Spinach Pan Mee’ is the one you are going after with finely chopped spinach that blend with flour and it is more like 80% pure of veggie in it that serve along with authentic soup base. ‘Curry Chicken Pan Mee’ after shooting and it was gone in seconds. 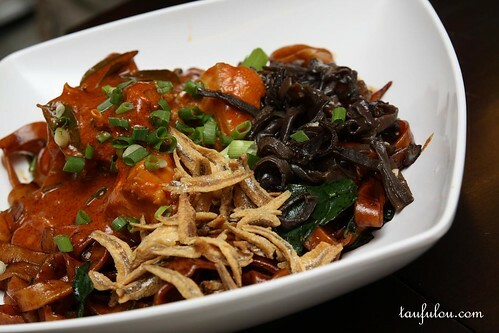 Thick Curry Chicken that pour upon the dry noodle that mix with black sauce just mix it very well, chicken is soft and juicy. 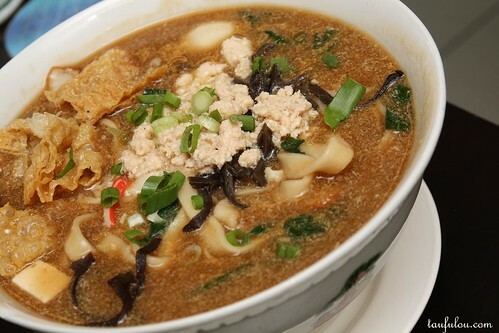 ‘Loh Pan Mee’ cook in the form of thick soup base, that do not taste very salty and a bit like shark fin soup taste but if you eat it pure the taste would not be that good, the trick is add in vinegar, it will pull up the taste and we add in the available vinegar given to us and finish fast. 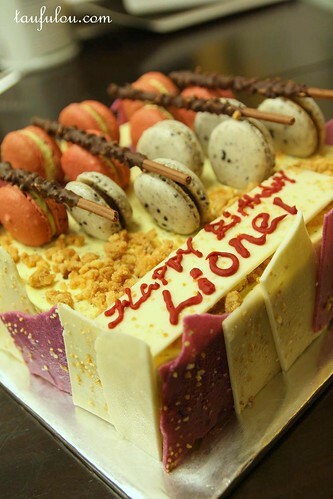 On that night it was Lionel Birthday and Sunny had prepared a Passion Fruit came for him. 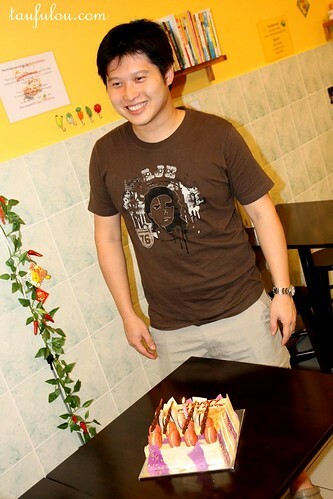 Lionel the happy guy for the night~ and of course it was a great discovery for us that we found a new nice place to eat and certainly I am going back for more that I would be recommending this place, as it is very reasonable in price starting from RM5.50 – RM9 per bowl. ermmm… . . . . . 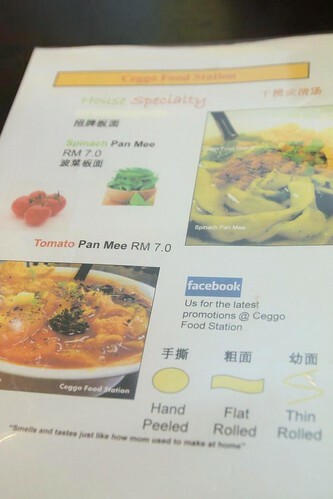 I would like to try that tomato pan mee!! AHHHHH!!!!!! i saw this place when i was there last Saturday to Little Jakarta. This is the place i told my bf that we must go during our next visit there! I am eyeing on the tomato pan me!! Yes, i will try that! Anyway, if you realised, there is one shop with bright green name board named Woo Pin at the corner facing the main road. 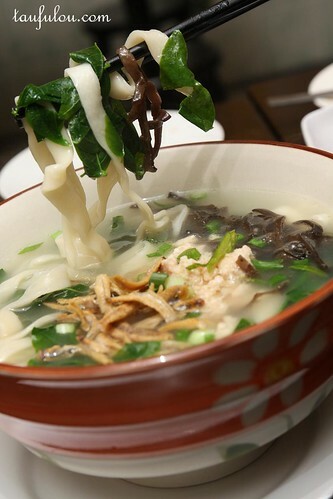 They are famous for fish head noodle during day. Only this month, they started night business too. Can give it a try. But for night shift, i dunno la. 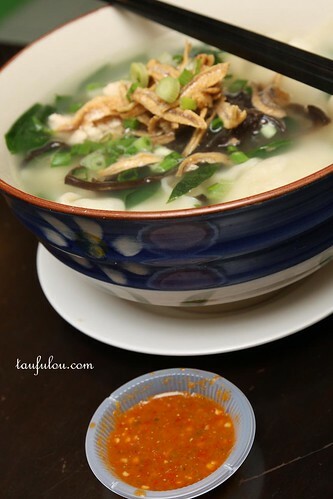 oh, that fish head.. did tried before and blog about it already also if not mistaken.. 😀 i still like the 1 in kuchai lama..more omph in taste..